An unveiling ceremony Oct. 8 at the Patsy Glen Refuge in Wimberley highlighted the new, revised Heart of Texas East Wildlife map. The series of maps denoting the hotspots for wildlife viewing first debut in 2003. Since that time new sites were added and new loops were designed to encourage viewing at several sites in a single outing. Wimberley and San Marcos both added three locations with directions to each site and potential critter sighting. Buda and Kyle also came on board, each with their own location. 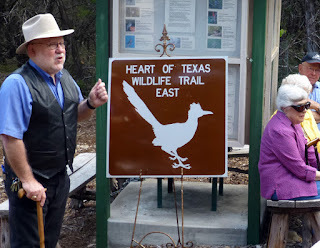 “There are nine wildlife trails that invite nature lovers to visit different regions of Texas to view native wildlife. Highway signs mark more than 960 viewing sites, and the website and updated print maps include GPS coordinates to make it easy for travelers to find some of the best spots to view wildlife. The maps also list contact information, entry fees and operating hours for certain attractions along the trails.